The narrator of the novel (born in 1921) lives in a world created by one event turning out differently, which lead to the secessionist south winning the American civil war and successfully forming the confederacy that they had aimed for. By the year that the novel is set in is reached, this has lead to a hugely powerful set of southern states, whilst the United States is a poor and backwards rump. The protagonist, a historian named, Hodgins McCormick Backmaker, narrates his life in the United States. Turning around a single event in the civil war which, in our history, led to the eventual triumph of the Union army, Moore suggests a timeline where the reverse happened. Where science fiction authors and some historians do occasionally muse “what if?” the character of Hodgins McCormick does the same: he is interested in how the Battle of Gettysburg was lost (from his point of view) by the Union forces, leading, ultimately, to defeat for them. Much of the novel is concerned with creating the world that existed in the aftermath of confederate victory. This is done highly effectively, the society and political landscape are believable constructions; the level of technical development is, for the most part, believable, though there are some elements that grated slightly. This wouldn’t always be worthy of comment, but given that there is such a focus on the development of the society (it almost seems as though the alternate world is the main character and not the historian), it is important that the author keep these elements as realistic as possible. Ward Moore reverses many of the “if onlys” that there (it sometimes seems still are) were amongst many in southern states to create a defeated and impoverished United States. One of the key reasons, of course, behind the civil war was the clash between abolitionists in the north and anti-abolitionists of the south, the treatment of black citizens in the United States of this novel is far worse than it is in the south. Though it should be noted that in the south there is still discrimination. In the north, however, African-Americans are blamed for the defeat of the United States and its current problems. They are encouraged to emigrate to Africa, or, if they stay, subject to abuse and attacks. Moore effectively recreates many of the same neuroses that he saw in the south of his own time in the north and manages to make the reader believe that this is a neutered country, unsure of its place in the world. In other words, where continuing to ask, with regret “what if” the south had won, can only continue to leave much of southern society dysfunctional, the same is the case in the north of this novel. This isn’t to suggest that the south in this novel is some kind of paradise – it’s pretty clear that, though it didn’t retain the worst of its practices, the world imagined here is worse than the 20th century we know. There is some interesting detail in this novel – the south in the book go on to extend their influence throughout central and southern America. When I first read this novel, this was a period in history with which I had only a passing acquaintance. Subsequently (and somewhat ashamedly, I have to admit that this was knowledge gleaned from the film C.S.A.) I learned that there is some factual basis for this happening had the south won the American civil war. Apparently there was a desire amongst some in the south to, once they had succeeded in leaving the union, to expand southwards. On the other hand, there are elements that I would question. This is a world without the internal combustion engine or aeroplanes. The novel is centred around a specific set f events that happened in the second half of the 19th century in one country and it seems unlikely that other countries would not have continued to develop these other forms of technology. If the turning point were further back, then these elements would certainly jar a little less, but ultimately, they don’t spoil your enjoyment of the book. This is one of those novels where the foregrounding of the setting isn’t unsatisfying (I wonder if, in part, this is because it clocks in at under 200 pages). Though the alternate history of the south winning the American civil war could be regarded as a bit old hat now, I can understand why it provides such fertile ground. It may be, of course, that I’m misreading things (as I’m not a resident of and have never been to the US), but often it seems that the south continued to remain frustrated by its loss in the civil war. It can seem that failure to come to terms with this meant that social development and cohesion in the south was retarded by falsely placed pride and a sense that an injustice had been done. In other words, the south for many years continued to ask this question. Failure to stop asking it meant that the important issue of civil rights was never properly dealt with, leading to the Jim Crow laws and the continued subjugation of the African-American population by, more subtle, if no less pernicious means. Despite some of the elements that I would personally question, and, as some would remark, looking at single hinge points in history can sometimes over-emphasise the importance of individuals and single events, Ward Moore created a complete and believable world. For this he is deservedly remembered and it is fitting that he is still known to SF readers and that Gollancz are keeping this novel in print. 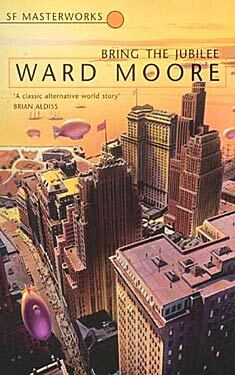 This entry was posted in Review and tagged alternate history, novel, sf, time travel, usa, ward moore. Bookmark the permalink. I have to admit that I have a bit of a penchant for alt-history, and do occasionally binge on it; but this is pretty key to the genre and does deserve to be read. I read somewhere else that the short-story that forms the core of this novel is actually better (in that it’s tighter, IIRC), but I haven’t – unfortunately – read that to be able to confirm or disprove this. I think this does hold up well-enough though. I don’t suppose you would be able to locate the short story,would you?I’m obsessed with Moore and am not aware of this. Richard,I am most grateful for this comment and I have been able to order this Greenberg/Turtledove anthology from Amazon.I have always thought the philosopher-dissident Tyss was central to Moore’s ‘Bring the Jubilee’,and I am very curious as to how this is presented in the novella version.Once again many thanks.